Hi all! My sister, Maggie just called for this recipe so I thought I would share it with you all. This is a family favorite that we enjoyed growing up at my granparent’s home and at our own home. It is simple, easy and quick and… oh so yummy! I like to serve it with asparagus or green beans. Dice 1/2 white onion. Place in skillet with 1 TBSP (ish) of olive oil. Sautee for approx 1 minute. Add ground round and salt and pepper to taste. Sautee until ground round almost cooked and add mushrooms (washed and sliced). Sautee for 2 minutes(ish). Add mushroom soup, sourcream and 1 tsp of Worcestershire. Stir and cook on low/ until bubbly. Serve over egg noodles or rice. I was just wondering when the Farmer’s Daughter was going to post something new … and, to add to it, I have wanted that recipe since I saw the pic on FB a cpl of weeks ago. Summertime is just around the corner and I can’t wait to see what great recipes come from a Saturday morning trip to the Seaside Farmer’s Market and from your dad’s farm basket that he brings you. Thanks for sharing your delicious treats. I will add that recipe! Thanks for following. 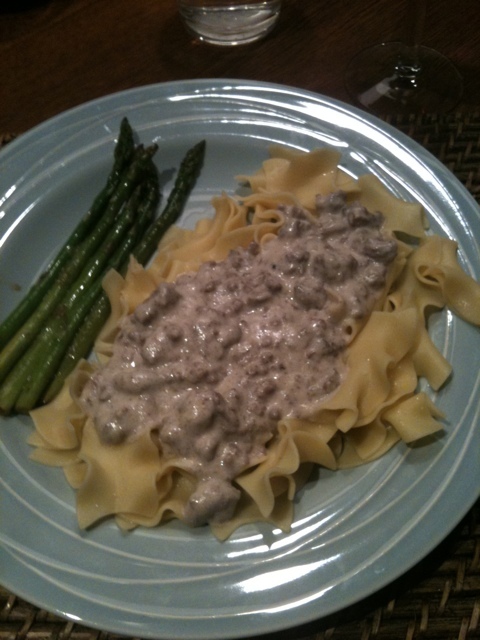 I made the beef stroganoff tonight and it was SPLENDID!!! I made it with asparagus and the egg noddles. Paige’s dish is a bit better, but I thought that mine was plenty darn good!! thanks sis! I love this recipe – simple and ingredients most of us have in our frig/pantry! Thanks for sharing Paige!